Noel’s Bus Charter Welcomes you to Greater Western Sydney. Noel’s Bus Charter a leader in charter services in Greater Western Sydney. For 20 years Noel’s has been serving Sydney and its suburbs such as Parramatta, Blacktown, Richmond, Penrith, and further afield with private tours by bus hire and minibus hire available to the Blue Mountains, the surrounding areas. We are a family owned company that has lived and worked in Western Sydney for over 30 years. We realise the need to provide good value to all of our customers. If you are a large organisation that needs conference transfers, airport transWhetherfers, or shuttle service we can customise a solution tailored specifically to your organisation's needs at an affordable cost. We also cater to smaller groups that needs transportation services and we will give you the same excellent service for your small group that you would receive with larger groups of 100 or more. With an extensive list of vehicles in the fleet to choose from Noel’s Bus Charter is sure to have the transport solution for you and your group. Working, and living in Western Sydney the staff at Noel’s Bus Charter are accustomed to seeing repeat clientele. For over 2 decades Noel’s has been providing top level customer service to all or bus hire and bus charter clients, and being located in the suburbs Noel’s tends to serve companies that also live and work in Western Sydney. You can also entrust your out of town guests to Noel’s Bus Charter and you will know that all of your transportation needs will be handled on time and professionally. 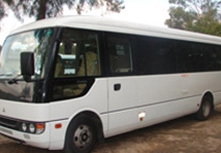 Corporations in Western Sydney and its suburbs of Penrith, Parramatta, Blacktown, and Richmond rely on dependable minibus hire, and Noel's Bus Charter services can provide transport for employee transfers, airport transfers, attending exhibition and expos, team building events, and training seminars. In addition to many corporate clients quite a few clients contact us to organise transportation for social events. Noel’s Bus Charter is happy to provide custom tailored transportation options for wedding parties, graduation parties, birthday parties, anniversaries, and also social clubs and groups for spa days, golf days and more. Tours are also available to the Blue Mountains or to the nearby wineries. Schools use Noel’s Bus Charter in the Greater Western Sydney area for school excursions, swimming carnivals, and sporting days. Safety and security are the main concern for Noel’s Bus Charter providing School Services. Please feel free to contact us to make a booking or ask any questions in regards to transportation needs whether for a corporate, school, or private group. Groups of 10-200 or more are welcome to enquire. Please allow Noel’s Bus Charter to take care of all your transportation needs in the Greater Western Sydney area.